Our Candidates Outperform the National Average Once Again! 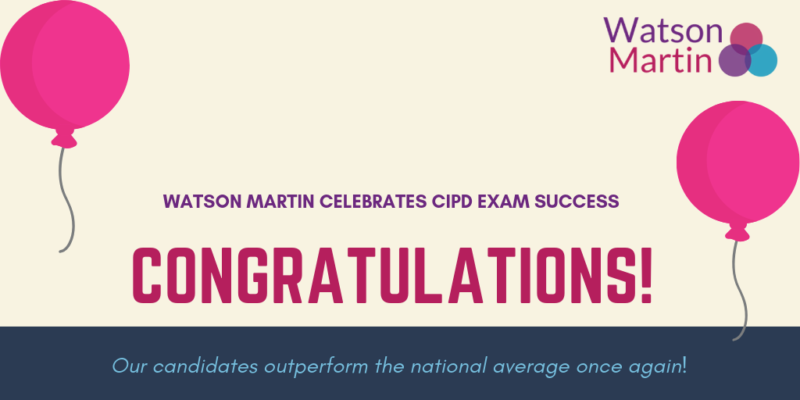 Watson Martin candidates notched up another impressive set of results in the latest level 7 exam results recently published by the CIPD. Once again, our students outperformed the overall national average with 76% gaining a pass or higher in their January 2019 Advanced level exams. High fliers do particularly well with Watson Martin. Overall, one in five (20%) of candidates who achieved a Distinction or Merit in the challenging exams studied with us. The performance of Watson Martin candidates sitting the Human Resource Management in Context (HRC) exam deserves a particular mention with nearly three quarters (73%) of entries achieving success compared to an average of 70% across all CIPD centres. 80% of our students gained a pass or higher in the CIPD’s Leading, Managing and Developing People (LMP) exam. “Our candidates work very hard to achieve success in these demanding exams and we are delighted they do so well,” said Melanie Martin, Director of Watson Martin. “Credit too must go to our excellent advisers who are all specialists with extensive HR and L&D knowledge. The tuition students receive, particularly during the exam workshops, really is second to none, a fact that is consistently acknowledged in candidate feedback on the independent review website Coursecheck. We are very pleased that Watson Martin continues to be the benchmark centre for qualifications and learning,” she added. As part of the CIPD Advanced qualification package with Watson Martin, all candidates who take exam modules will attend up to four workshops, two for each module, to ensure they are fully prepared, along with the individual tuition they receive from their adviser. Additionally, all candidates have access to our highly innovative Virtual Learning Environment (VLE) where they can take advantage of a wide range of online resources.